If you have accidentally formatted your USB device that held all your important data, and all your data seem to be lost, it is highly possible to retrieve all your lost data without any damage to the data using AnyRecover data recovery software. This excellent data recovery software can recover formatted USB data, and lost or deleted data from damaged USB. In precise, this data recovery module can recover any document, image, video and any other data as long as the partitions exist. AnyRecover is a third-party software to recover lost data on computers, USB flash drives and all other storage devices. Recovering files after mistakenly formatting your USB device won’t be a headache anymore. It can be as simple as 1-2-3. Let’s check out some main features of AnyRecover. Recover all Senarios: It can easily recover them just in a few minutes for a variety of data lost situations. Recover all data types: It is easy to recover quickly all kinds of data formats e.g., documents, photos, videos, audios, etc. Recover from all storage devices: AnyRecover can recover data from internal hard discs, external drives, memory cards, etc. Recover corrupted or damaged partitions: This recovering tool will help recover the whole partition without causing harm or damage to the data or information. Free trial before purchase: This trial version offers you the possibility to preview all lost files freely without paying any dime. 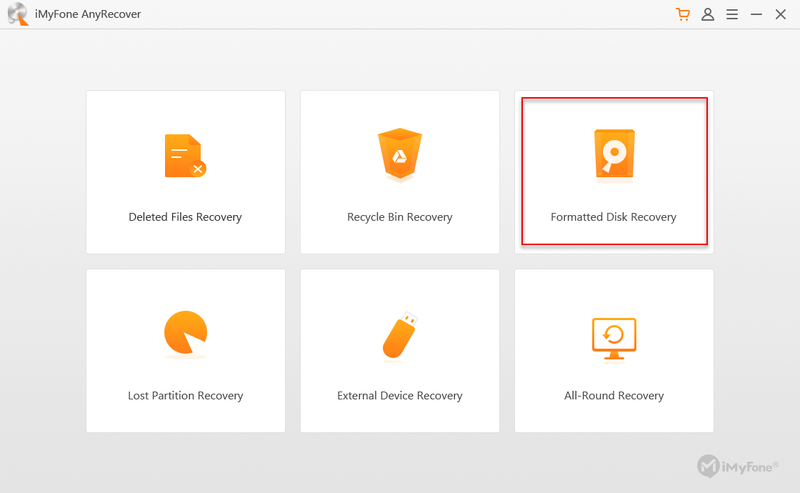 Step 1: Start AnyRecover application, from various data recovering modules select “Formatted Disk Recovery” . Step 2: Choose your USB drive from the External removable device, and click "Next" to continue. Step 3: From the USB drive, select file types from all options and then scan. It is advisable that you wait till the full scan finishes to get the best recovery result. Ensure you specify the needed files system and the file types before scanning. Then click "Scan". Step 4: You can preview the scanned files by double clicking each and select the needed ones to recover. Step 5: Hit “Recover” button to get back your lost data. Note: Please do not save the data to the USB drive in order to invoid data overwritten. Save all the needed and recovered files in another drive, USB or different partition from the original USB device. Do not write new data or transfer old data on information to the formatted USB device because it may overwrite other data. Avoid formatting your USB device many times to avoid damage to your USB device or complete loss of data memory. Always have a back up of your relevant data for ease of retrieval in the event of mistakenly formatted USB device that has been overwritten. A lot of people find it difficult to believe that it is possible to recover data after formatting your USB device. Yes, this is possible as the deleted files are not permanently erased from your USB device. You can still recover formatted USB device. However, you should stop writing new data or information to the formatted drive as this may permanently overwrite the previously saved data and can't be recovered again even by the best data recovery software.